Not bad for a bunch of Government Girls who gave a buck a piece. 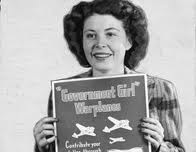 Thus concludes "Government Girls bought planes to fight war and stereotypes," a recent Washington Post item. Columnist John Kelly explains that "Government Girls" was "the nickname given to the thousands of young, single women who had flooded into Washington" after the United States entered World War II. In effect the pink-collar sisters of blue-collar "Rosies," they filled clerical and administrative posts depleted when men went to war, and many chafed at the stereotype that "they were in D.C. just to sightsee and bed soldiers." One had an idea, to show their patriotism by contributing $1 each to help the States buy warplanes. (credit for photo of Cherry Mitchell, who worked at the U.S. Office of War Information) With the funds they raised, two planes were purchased, christened in a ceremony that featured several of the Girls, and then deployed to the Asian theater.